Official MIUI 9 for Redmi Note 4, 4X is now available for the download. Few days Xiaomi team announced the MIUI 9 with the new MI 5X smartphone. And from the next month, Xiaomi phone’s users will receive this new MIUI 9 updates on their devices. MIUI 9 comes with lots of new features like a smart assistant, smart app launchers, new themes and lots more. You can check out the video here and know more about the MIUI 9 features. As you guys now that the released date of the MIUI 9 is 11 August, but we manage to get our hand on the latest version of MIUI 9 China ROM on our Redmi note 4. We tested the MIUI 9 China ROM on our phone and it works smoothly and pretty fast. The ROM doesn’t come with the Google application, but that’s not the big problem. You can easily install the Google App on MIUI 9 from the MI Store application. If you are interested in checking the MIUI 9 ROM on your phone. Then here is a full guide which you can use on your Redmi Note 4 and 4X and install the MIUI 9 rom on your phone. To apply this method on your phone, you have to unlock the bootloader of your phone. If your phone’s bootloader is locked then this method will not work on your device. To flash this update on your all you have to Download Official MIUI 9 for Redmi Note 4, 4X and install with the Xiaomi Flash tool or you can also use the third party app XiaomiTool to install this update. Below is the fastboot file of the Chines MIUI 9 ROM. Download the files and save it on your desktop. To flash this file you have to install the MI Flash tool on your desktop. 1. As we mentioned earlier to apply this update, you need to unlock the bootloader of your phone. First, unlock the bootloader from here. 2. Now install the MI Flash tool from here. This will help you to flash the Fastboot file on your Redmi note 4. 3. To connect your phone to the PC you need a proper ADB and fastboot drivers. Download latest ADB and fastboot drivers here and install on your phone. 4. Once all the above methods are complete on your desktop. 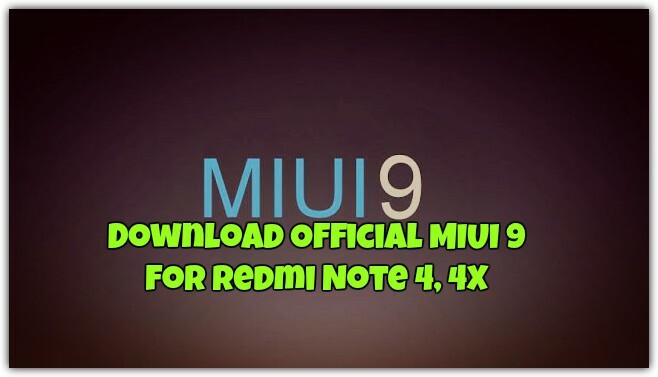 Then read this guide How to flash fastboot ROM On Xaiomi phone to update your phone with latest MIUI 9. OR. Check out this video to flash the MIUI 9 ROM on your phone. I am install twrp in my mobile, my mobile in warranty. Installing MIUI 9 Doesn’t void the warranty of your phone. Mera bootloader unlock nahi hai Redmi note 4 ka aur jab main bootloader unlock karne jaata hu aapke batai hue link se aur mi flash tool download karke to ye mujhe ek aise page pe le aata hai jaha sirf mi flash tool download karne ke liye hota hai waha ye details jaise name,phone number,reason for unlocking ye nahi aata.To ab main bootloader kaise unlock karu.PLease help me. Will it work on any Xiaomi phone?